A Bob's Life: It Worked! I have to provide a follow-up to the washing machine repair project that occupied my time for the better part of two days. I finished it! It works! It was quite process, but I worked through it, step-by-step and got everything reconnected. 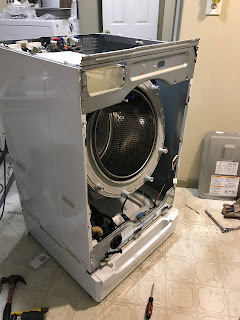 I have to admit the YouTube video by Appliance Parts Pros was excellent and even had some really good tips and tricks to make the job possible. I never could have completed the job without the video. How did we ever repair things before YouTube? Oh, yes, I remember, books! I remember the Chilton's manuals for performing auto repairs! Changing the bearings was one of the toughest aspects of the project. Pounding out the old ones without damaging the drum and then getting the new ones installed into place was a slow process that often appeared to be making no discernible progress. I actually had to buy a new and heavier hammer and a punch to get the bearings removed and installed. I do enjoy getting new tools when I complete a project. This project is in the books and I even remembered to clean the metal shavings out of the filter. 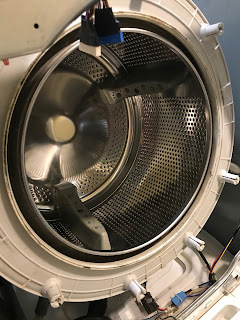 It felt good to see Chris carry a basket of clothes down to the laundry area and know that the washer was ready to perform its designed function.